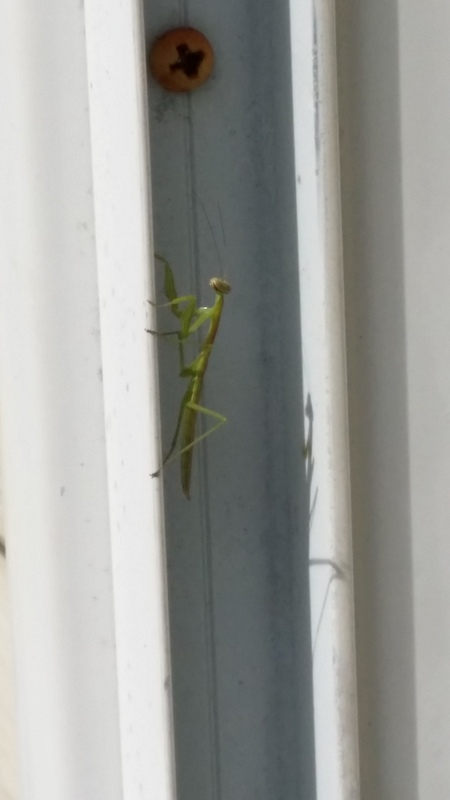 I saw this teeny baby praying mantis on my door frame yesterday. I snuck out the other door and came upon him. He was alerted and moved a little. He was so tiny. I used this shot because you can tell his size by comparing him to the screw head in the photo. I remember when we were kids, it was said that you could not harm a praying mantis or you would have to pay a hefty fine. Not that I ever wanted to harm any creatures, but I always wondered how would anybody know to be able to assess a fine? Yes dear Line…This is the tiniest baby praying mantis I have ever seen. They are strange little creatures. They move very slowly…deliberately (unless they are catching their dinner…which can be grasshoppers!!) Their heads are shaped like a triangle (with 2 giant eyes and 3 more little ones in between…yet they have only one ear) and they can move it 180 degrees to either side. It is a little creepy to come upon one and it turns it’s head around on it’s back to see you! They also have wings and fly…and they have to dodge bats who view them as a tasty morsel. The female is a cannibal who usually kills the male after (sometimes during!) mating. I also found out that it was an urban legend that you could be fined if you harmed one. And Thank You so much for the compliment on the “new look” of my blog. I had been thinking about changing it…and just started playing yesterday…when I got to this version it just felt right…so I went with it! Hi Heart to Heart Robyn! How are you??? I remember thinking they were a little creepy as a kid…I think it was that whole head turning 180 degrees to look over it’s back! But I also thought it was pretty cool for a bug to pray!! We have pretty large geckos in south Florida also…when I see a particular large one I call it “an alligator!” Hope you are enjoying the peace and serenity of beautiful Maui…many blessings to you!! Beautiful new fresh blog feel and yet, as always, you capture our hearts with your posts! I love the baby praying mantis!